GEI Luncheon in honor of Hon. Stefania Prestigiacomo, Italian Minister of Environment – New York, May 13, 2009 – Remarks by Lucio Caputo – President of GEI. I am very pleased indeed to welcome Minister Stefania Prestigiacomo to GEI. Stefania Prestigiacomo, as you know, is the Minister of Environment, Land and Sea in the present Berlusconi Government. Born in Siracusa (Sicily) she holds a degree in Science of Public Administration. 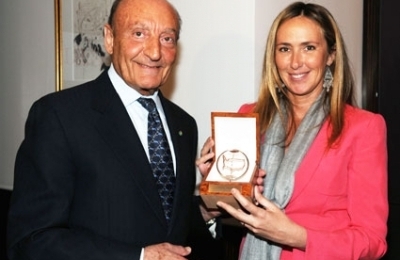 At the age of 23 she was elected President of the Young Entrepreneurs Group of Siracusa. In 1994 the Hon. Prestigiacomo was elected to the House of Representatives as a member of the Forza Italia party. On May 13th, 2001 she was reelected to the House of Representatives and from 2001 to 2006 she was a member of the Berlusconi Government as Minister for Equal Opportunities. As Minister for Equal Opportunities she promoted the bill amending article 51 of the Constitution in order to guarantee equal opportunities between women and men in the access to public offices. She also co-promoted a bill amending the Penal Code regarding crimes of slavery and trafficking of human beings. Other bills proposed by the Hon. Prestigiacomo concern the National Plan for kindergartens in workplaces and legislation on street prostitution. During the period 2006-2008, as a representative of the opposition, she was a member of the Labor Committee of the Chamber of Deputies. She was elected again to the House of Representatives for the “Popolo della Liberta’” (People of Freedom) Coalition in the political elections of April 15th, 2008. On May 8th, 2008, she was nominated Minister of Environment, Land and Sea. As a Minister she has been very active in several fields. One of the most recent endeavors of Minister Prestigiacomo was the G8 Ambiente summit held, under her presidency from April 22 to 24 at the Castello Maniace in Siracusa. The event was a great success and I understand the Minister is going to illustrate the accomplishments of this event that is preceding the G 8 meeting of July in L’Aquila. It is with great personal pleasure that I present Minister Stefania Prestigiacomo with the “GEI Friendship Award” in recognition of her many and successful accomplishments. The luncheon was held on May 13, 2009 in the Stella Private Room of Le Cirque restaurant in New York City.